Living in Delhi, one begins to take for granted its exquisiteness, the beautiful parks and stunning monuments. 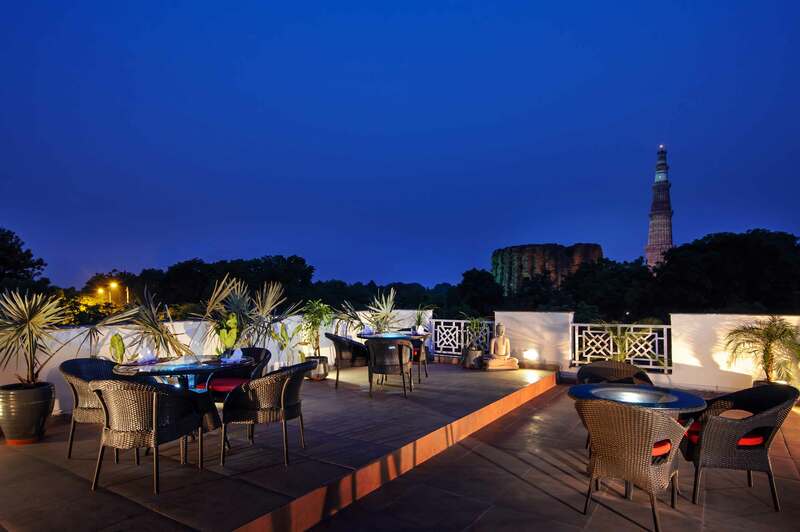 This is why sometimes it takes dining at a place like ‘EN’, with its view of the majestic Qutub Minar to makes you appreciate and fall in love with the beauty of Delhi all over again. ‘En’ is a holy word, it means Synchronicity; a blessed relationship, an invisible connection of fate and destiny. Hence, merging various styles, essence, ingredients & preparation techniques from around the world with the spirit of Japan, the highly specialized chefs at En bring to you a superb reinterpretation of Contemporary Japanese Cuisine. Spread over three levels and divided into various areas, the design thought behind En highlights the harmonious coexistence of two strong cultures, Japanese & Indian. The century old royal heritage Haveli that is home to En has been recreated to harmoniously match the theme of a Japanese restaurant. 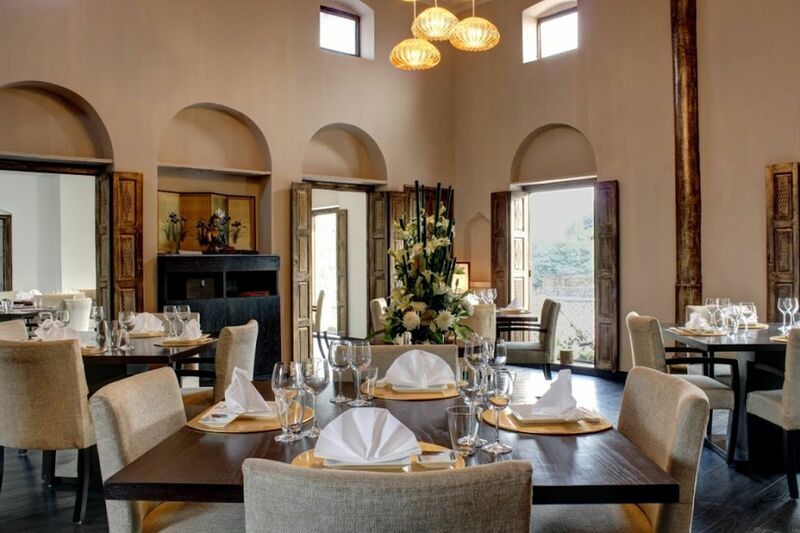 And, rather than conform to the clichéd ornamental look like most oriental restaurants, the space has a minimalist appearance that flaunts timeless style and elegance. The interior layout has been done intelligently with seating that can be converted smoothly into private dining rooms that could accommodate 6, 8, 12 and 20. Complete with a Sushi bar and a bar, the fine dining area is radiant with a combination of natural and artificial light, bringing to life a composition that boasts of an unassuming earth-tone interior elements set off by clean lines. ‘aka’ – Red (believed to be the color of the Sun), the sacred color of Japan, finds its way into the furnishings gracing the space. The luxurious placement of bay windows throughout the fine dine space allow diners unparalleled views of the surrounding green belt and the ubiquitous Qutab Minar. While the interior fine-dine space at En exudes ample charm, the terraces, aptly named ‘The Tableu’ sets a tone of its own bringing visitors to the piece de resistance of the venue. The view on all four terraces is nothing short of breathtaking, with the Qutub Minar as the main highlight. In fact, keeping this ambiance in mind restaurant had its first Sufi night on 26th April, where the atmosphere was mesmerising and left all those there wanting more! Japanese food is one of the healthiest in the world and still remains the most distinct cuisines in the world. A few aspects that set Japanese cuisine apart from other cuisines is it’s emphasis on using quality ingredients, unique seasoning its impeccable presentation.The menu at EN bears witness of the rich epicurean roots of Japan. Though Japan is rich in culture and has a variety of different styles and cuisines, ‘En’ brings to you that culture of fine dining and authentic cuisine that’s savored only in Tokyo. We decided to go in for the set menu, so as to get a taste of the entire range of dishes served at the restaurant. We began with a dish that included Bean with Black sesame with Nanbanzuke and Prawn balls. The black sesame was out of this world, I can use it as a seasoning on almost anything I want to eat. We then had Kakiage and Tempura, which are actually similar dishes but I preferred Kakiage and now with this new knowledge I know next time to ask for Kakiage instead of Tempura. We then tried a mouth-watering assemblage of award winning Sushi & Sashimi, and a ‘so soft it melts in your mouth’ braised pork belly. We then tried ‘Chawanmushi’ or egg custard, an authentic Japanese dish the only thing on the menu I could not eat, as I think that is a developed taste and will take a long time for me to get there. Of course this was followed with an addition of Rolls and Maki & Teppen-Yaki and an exhaustive rendering of Noodle & Rice dishes… all washed down with a cup of signature Houjicha, Japanese Black tea and Sorbet for Dessert. All in all, I can’t wait to go back, sip my wine while I enjoy the view of the stunning Qutub Minar and enjoy an exquisite meal. Posted on May 20, 2014 May 20, 2014 by AparnaPosted in Decor, Food and Beverages, Lifestyle, Reviews, UncategorizedTagged decor, design, Haveli, Japanese cuisine, Lifestyle, Maki, Mehrauli, New Delhi, Olive bar and kitchen, Qutub Minar, review, Sashmi, Sushi, Tempura. Next Next post: Chalkboard Art! !